VB, mother of three adult children, and one minor child, was a Dade County Public School bus driver. She was killed when she was attempting to make a left hand turn into the Miami Dade School Bus Compound. She was approaching her turn, with the right of way, when she was crashed into by a drunk driver who ran his red light. The crashed caused VB to be ejected from her vehicle. She died at the scene. The Defendant, Lucan Billy Frank, had been out all night drinking at a local “Gentleman’s Club.” He was apparently on his way home, still drunk. After he crashed into VB’s vehicle, he fled his car, and the scene of the accident, running into a nearby wooded area. The police established a perimeter and eventually apprehended him. Police arrested Frank, charging him with vehicular homicide, leaving the scene of an accident involving a death, DUI manslaughter and failure to render aid. Unfortunately, Frank, and his mother, Agnes, the owner of the vehicle (and civilly liable along with the driver of her vehicle), maintained only a small liability insurance policy of $35,000.00. 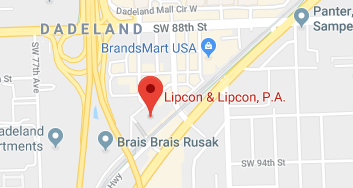 The family of the victim hired David Lipcon, of the law firm Lipcon & Lipcon, P.A., who specializes in personal injury cases in the South Florida area. Lipcon made sure that the insurance company quickly tendered those policy limits to the family. Knowing that the recovery was hardly sufficient to compensate the victim’s family, Lipcon quickly opened up an investigation and then brought a law suit against the Frank family. Mr. Lipcon tells us that collecting judgments and damages, in addition to and outside of the available insurance limits in Florida, is usually highly unlikely. Most people in the State are “judgment proof” as Florida is one of the friendliest States in the nation, to a debtor. The Franks are members of the Miccosukee Tribe of Indians of Florida. Lipcon learned, through his investigation, of a “stipend” that the Miccosukee Indian Tribe pays its tribe members. This was difficult, considering the Miccosukees are the only tribe in the continental United States that does not disclose the amount of the stipend that each member receives. After lengthy litigation, and negotiation, the case was finally settled for an undisclosed amount. This settlement is widely considered the first of its kind, as the Tribe is well known not to acknowledge the stipend funds. Due to confidentiality clauses in the settlement, Mr. Lipcon would not tell us how much the family of VB received, who paid, or whether the funds where provided by the Miccosukee Indian Tribe. He was able to tell us, however, that the children of VB received a significant settlement amount, enough to take care of the family for generations. Lipcon does not believe that any similar settlement has ever been achieved before, involving the Miccosukee Indians, and is not aware of any similar case that is currently on-going. Settled just weeks before trial for an undisclosed amount.